Do you want to become an expert in Epoxy Flooring ? 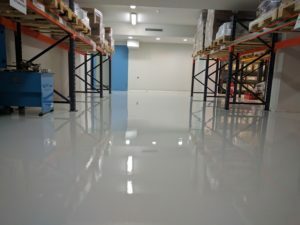 Have a look at that stunning smooth epoxy floor in the picture below. Wouldn’t it be great to be able to deliver such great floors to your customers? You need both knowledge and experience. You need the experience on the field, to realize that most floors will not look like those cute photoshopped brochures provided by the coatings manufacturers. But you also need the knowledge. The knowledge to understand why the same product will behave very different on a cold winter day and very differently in a sweltering hot and humid day. And every seasoned professional has a bubbles horror story when the whole floor filled up bubbles and pinholes on the next day.. You call up the local company rep who gives you some BS excuse about humidity rather than helping you solve the problem… But anyone who’s been doing epoxy for some years, knows that it is seldom one reason that is causing bubbles. It is much more complicated than that. So I created this online course that is jam packed with real-life knowledge and experiences from doing epoxies. Material from spending ten years in the trenches, where I share my experience both as an applicator and as a manufacturer. In fact I am so sure that you will like my material that I am prepared to give you your money back if you feel that this course was not for you. This course comes with a 30-day money back guarantee. So how do you join? 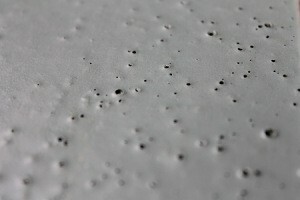 The cost to join is just $97 (USD), which is about the cost of one large pack of epoxy coating! Imagine how much knowledge and value you will get for that price! Click on the link or the RED button below. Enter your payment details and your email address and you will immediately get a an email with links to watch/ download the learning videos. So who is this guy that created this course? You can click on this 5 minute video below and meet me in person. My name is Akis Apostolopoulos and I have 10+ years of practical experience in the manufacturing and application of epoxy and polyurethane based floor coating. I have successfully completed challenging industrial flooring projects for multinational companies in sectors such as food production, pharmaceuticals, retail, and car parks. 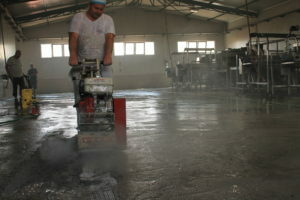 I am the owner of Ktisis, a floor coatings manufacturing company with customers in Europe, Africa and the Middle East. In 2015 I founded LearnCoatings with the purpose of improving our knowledge on epoxy flooring worldwide. But wait! If you sign up today you will also get TWO SPECIAL BONUSES. 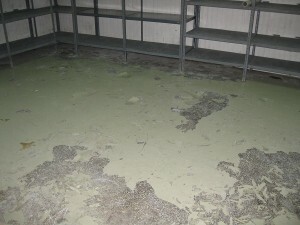 The first bonus is a troubleshooting guide that lists the most common problems with epoxy floors. The other bonuses are two handy checklists. 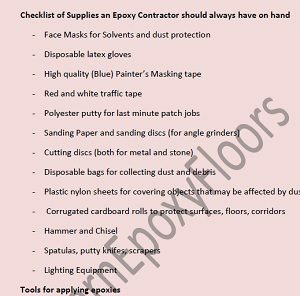 The first sheet is a list with all the basic supplies that you should have when you are carrying out at an epoxy project. The second checklist is a list of nine things you should check before starting to coat the final coat on a flooring project. What if I sign up and realize that this course is not for me?